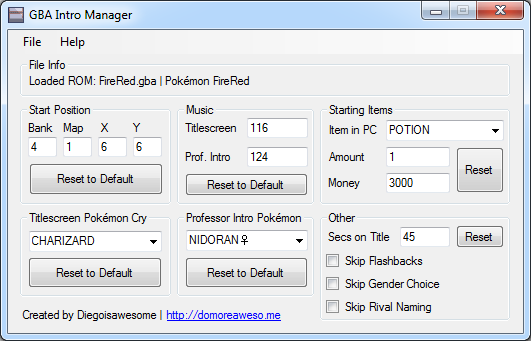 This program can edit almost anything about the intro sequences of any 3rd generation Pokémon game, from the music played to the position where the player spawns. Some notable inclusions are a proper truck removal patch and the fact that not only the image but the cry of the professor's Pokémon are changed. It also includes many of my older patches right inside, such as the gender choice skip, and the "intro enhancement" patches that allow for the X and Y positions of the starting position be changed. Best of all, though, is that it's safe to use. I've seen other intro managers that do really unsafe things, like replace a "mov r1, #0x0" instruction in order to fit in more possibilities of Pokémon IDs. This one works around these issues when it can, but avoids them entirely when it's not easily doable. This program requires .NET version 4.0 or higher. Also, I'm really sorry for not releasing this as a multi-platform program, but I used C# and .NET to make it, so multi-platform compatibility isn't easy. Jambo51 - Used some of his Trainer Editor source for stuff like INI reading and game text-reading. colcolstyles - For the discovery of the "seconds on the title screen" value. xGal - For writing the tutorial that I used to start this foray into the world of hack tool creation. Last edited by Alice; 2nd March 2018 at 10:41 PM.